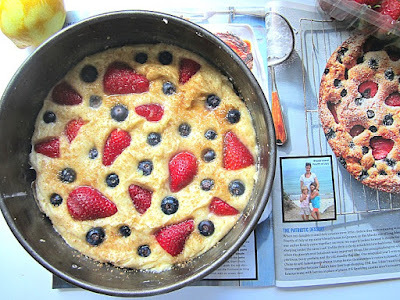 This is your typical summer berry cake.....easy to make and always a crowd pleaser. There's nothing fancy going on here, it's just about the summer berries. Raspberries would be extra good in this recipe, but I had blueberries and strawberries. 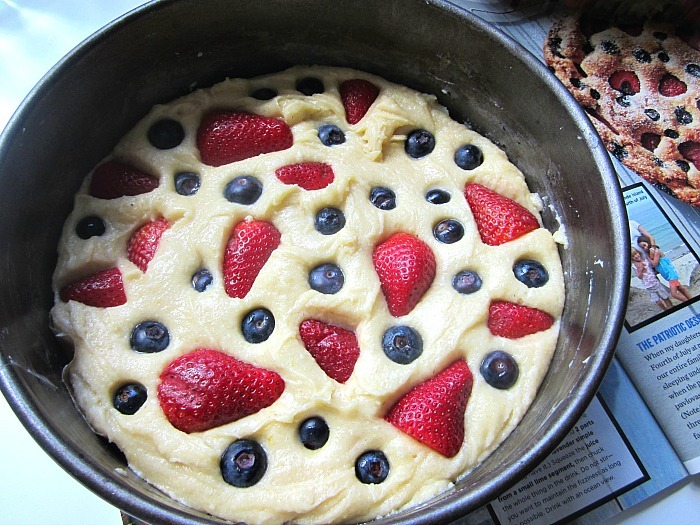 With some whipped cream on top, we can call it a red, white and blue-berry cake. It's important here to use an 8" springform, because the batter makes a small cake....(you can also use a 9" Pyrex glass pie plate, for some reason, these 8" cakes come out nicely in the pie dish). In a large bowl, cream the butter and sugar for 3 minutes with a mixer, until light in color. Add the flour, baking powder, salt, and eggs, and beat at medium speed 1 minute, scraping down the sides of the bowl once. Spread the batter evenly into an 8-inch greased springform pan. I like to line my springform pan w/ a circle of parchment paper. Place blueberries and strawberries on top of the batter, pressing lightly into the surface. Drizzle lemon juice evenly over the top. I sprinkled some turbinado sugar on top for a nice crunchy crust. Bake 45-55 minutes or until golden. Remove and allow to cool slightly in the pan. Run a knife around the edges, and remove sides of the pan. Top with powdered sugar or freshly whipped cream to serve. 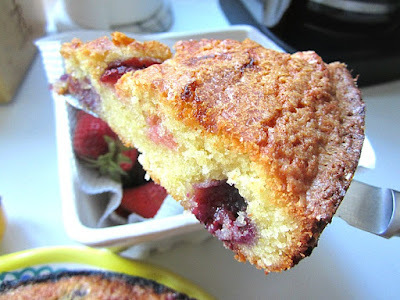 My fruit sunk into the cake after baking, but it was fine....tasted delicious anyway. Delicious! I made two this morning, one for us and one for neighbors, swapping out the strawberries for black raspberries from our yard for theirs (strawberry allergy). I'll probably make another tomorrow. I'll bet peaches would be great, also. I think this has lots of possibilities - I love the combination of ripe nectarines and blueberries. Too-large slices of the former could mess up slicing, so consideration should be given when preparing the fruit. I’ll probably stick with strawberries as I got a deal at Aldi’s - $.89 for a 1 lb clamshell from one of the very best Watsonville (CA) growers. Wishing you all a happy, peaceful, fun-filled 4th. God bless America!